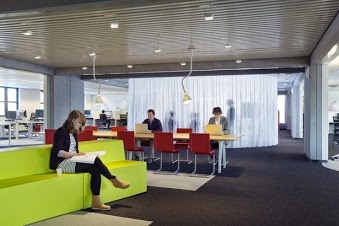 What do the new flexible working laws mean for office design? From 30 June 2014, all employees have the legal right to request flexible working - not just parents and carers. The Department for Business, Innovation and Skills said 20 million people now had the right to ask to work flexibly and signs are that employees are already taking advantage of the change in the law. A survey among office workers around the country by Powwownow found that, within a week of the rule change, 8 per cent of respondents had already filed a request for flexible hours, with a further 11 per cent saying they wanted to follow suit. Just over one in three people in the survey said that in the future, flexible working was something they would consider. Technology and collaborative working practices have been driving changes in office design and layout for some time now so how will workplaces need to further adapt to allow for more flexible working? Hot desks ? desk with shared use in open plan, often bookable, perhaps in a hot desk zone. Hot office ? enclosed room with desk for shared use, often bookable. Team table ? large work table for use by a number of individuals ? either shared or for one specific team. Touchdown desks - Smaller desks in open plan for shared use for shorter lengths of time. Touchdown benches ? high level shared short-stay work bench, with high stools or stand up use. Browsing base ? high level work/layout surface, often on top of cabinets, with high stools or stand up use. Project space ?area of the workplace that?s designed to support ad-hoc project work, often table and white/scribble board. Informal breakout space ? cafe or lounge style area within the office for ad-hoc discussion, solo work or breaks. Services area ? shared, often semi-enclosed space for centralised printing and copying.